Faatalofa atu i le paia ma le mamalu ua mafai on asiasi mai i lenei itula. Ia manuia la outou folauga i luga o lenei web site poo lenei itulau ua faatuina e si a maua fanau a ua aiga pele ma uo pele o loo alala i nu'u mamao ma e fo'i o lo'o alala i lenei motu o Hawai'i. It is our hope to keep this site available for all our relatives and friends around the world. We find this form of communication affordable and reliable in terms of relating messages and sharing precious moments with the rest of our family and community. Faafetai and Mahalo for visiting. Gob Bless! Sending you all a warm sunshine smile (*_-) from Paradise! 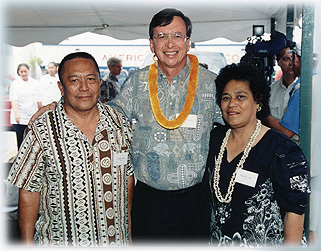 A photo with mayor of Honolulu at the Samoan Service Providers' Business Center grand opening.